The MINI Cooper S Convertible symbolises the thrill of motoring in the open air and bears out the unmistakable style of the MINI brand. 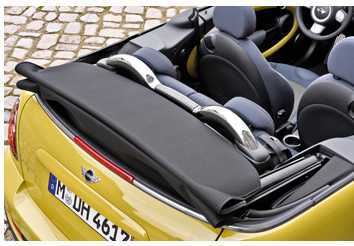 Moving up to an even higher standard than on the former model, the unique features of the MINI Convertible in its segment in terms of design, premium quality, handling, performance, efficiency, and functionality have been appropriately enhanced and improved to perfection. Evolutionary enhancement of the car's design: The body with two doors and a soft roof including a separate sliding roof function ensures unique, unmatched proportions, sleek, horizontal lines, and truly individual style. Design language typical of the brand, design features and proportions clearly making the new model a genuine, fully-fledged member of the MINI product family. Refined, sophisticated overall appearance highlighting the stretched silhouette and ensuring enhanced presence from both front and rear. Sophisticated, beautifully modelled body surfaces, roadster-like flair ensured by the low roofline, rollover safety bar hidden away out of sight. Front and rear light design as on the current MINI models. Inner-mounted four-pivot joints for the luggage compartment lid ensure a harmonious and smooth look with even greater emphasis on the wide rear end. Electrohydraulic operation of the roof including sliding roof function featured as standard. 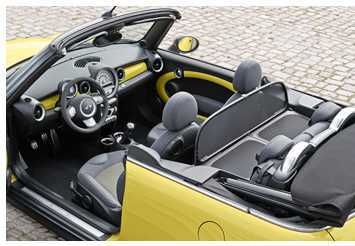 Option to open and close the soft top while driving at a speed of up to 30 km/h or 20 mph. Optional Always-Open Timer as a special feature determining the time spent travelling with the roof down. Even wider range of paintwork colours, roof colours, wheel rims, upholstery and interior trim providing even greater freedom in customising the car. Model-specific range of optional extras and special equipment. 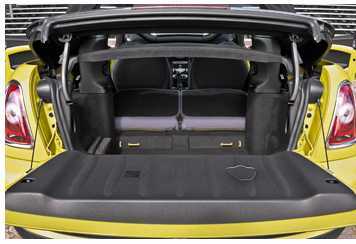 Newly developed, electromechanically operated rollover bar behind the rear seats, activated by the car's central safety electronics in the event of a possible rollover. The innovative, absolutely unique principle of a single-piece safety bar allows optimum visibility to the rear and facilitates visibility to the side. A further advantage is the option to integrate an exceptionally large through-loading storage option between the luggage and passenger compartments. Outstanding functionality ensured by the flexible storage concept. Easy-load system providing an even larger opening into the luggage compartment, rear seat backrests folding down individually and lockable in position, luggage compartment cover fastening in two positions, as required. Luggage compartment capacity increased to 125 litres (+5) (4.38 cu ft) with the roof open, 170 litres (+5) (5.95 cu ft) with the roof closed, and 660 litres (+55) (23.10 cu ft) with the rear-seat backrest folded down. New generation of four-cylinder petrol engines with twin-scroll turbo-chargers or, respectively, fully variable valve management. 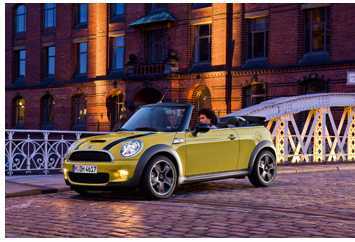 Engine capacity 1,598 cc, max output 88 kW/120 hp (MINI Cooper Convertible) and 128 kW/175 hp (MINI Cooper S Convertible). Both engine variants with a wide range of technical features serving to optimise both fuel economy and emissions: Auto Start Stop, Brake Energy Regeneration, gearshift point indicator. Front-wheel drive, go-kart feeling typical of the brand with refined suspension technology tailored specifically to the MINI Convertible. Electric Power Steering (EPS). Brake system with anti-lock brakes (ABS), Electronic Brake Force Distribution (EBD), Cornering Brake Control (CBC), and Brake Assistant as well as Dynamic Stability Control (DSC) including Start-Off Assistant all featured as standard. Dynamic Traction Control (DTC) including electronically controlled limited-slip differential function on the drive wheels available as an option. Crash-optimised body structure with newly conceived floorpan and A-pillars and side-sills appropriately reinforced for a convertible. Body stiffness further improved over the former model, with a reduction in vehicle weight by 10 kg or 22 lb. Three-point inertia-reel seat belts on all seats, with belt latch tensioners and belt force limiters at the front, frontal airbags, head/thorax airbags at the side integrated in the seat backrest, rollover sensor masterminding the rollover safety system, airbags and belt letch tensioners optimised in their function. Runflat tyres and Tyre Defect Indicator. MINI Cooper Convertible: Four-cylinder petrol engine with fully variable valve management based on the BMW Group's VALVETRONIC technology. Capacity: 1,598 cc Max output: 88 kW/120 hp at 6,000 rpm. Max torque: 160 Nm/118 lb-ft at 4,250 rpm. Acceleration (0-100 km/h): 9.8 sec Top speed: 198 km/h (123 mph) Average fuel consumption to EU standard: 5.7 litres/100 km (equal to 49.6 mpg imp), CO2 rating: 137 g/km. © Chic and Style Limited 2000 - 17. All rights reserved.